The Kitchissippi Museum: An invitation: The Kitchissippi Heritage & History Group - Kick-off Meeting Sunday February 28th! 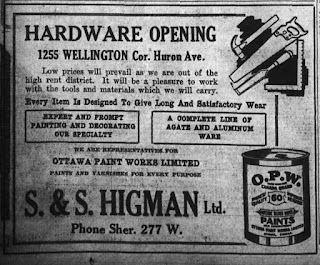 An invitation: The Kitchissippi Heritage & History Group - Kick-off Meeting Sunday February 28th! I'm happy to announce that I have finally been able to set a time and location for the first get-together of my long-talked-about group for local history buffs. Right off the bat, I have to state that I don't know where this group will take us. There really is a strong and steadily growing amount of interest in local history; more than I've ever experienced before. So I think that it would at minimum, be fun to get a group of us together on a semi-regular basis to talk about local history, and explore ways that establishing a formal community could be of benefit. I appreciate all the interest and support my little blog has received over the last year, and have heard and spoken to quite a few people who seem as excited as I am about the idea of forming a little committee of sorts. Perhaps we end up having a meeting every two months to get together and chat, hear a presentation or two, share ideas and promote local history projects going on, etc. Or perhaps we establish more of an online connection, through a Facebook group or webpage. There are a lot of ways this could work, and I have no idea even the numbers of people that could be interested. It might be 10 of us, there might be 50, there might be hundreds. I see one obvious project that a group of us could help take on: that being to help the City of Ottawa update their dangerously out-of-date Heritage Reference List. Much work is required in doing research and providing information on heritage designated and listed structures and properties; and more importantly, to identify many important homes and buildings which are absent from this list. The kick-off meeting will be on Sunday February 28th, 2016, from 1-3 p.m. in the Exposure Gallery, upstairs at Thyme & Again (1255 Wellington St W). (1) A short presentation on Cave Creek, the long-time scourge of Kitchissippi which caused incredible problems for Hintonburg, Mechanicsville, Wellington Village, Hampton Park, Carlington, Westboro and other parts of old Nepean Township, and even caused a devastating typhoid epidemic in Ottawa in 1911. Lots of rare photos, maps and info to be on display. (2) A presentation on the heritage designation process in Ottawa, and a look at what is (and is not) recognized within Kitchissippi's boundaries. I'll have on hand some summary numbers, as well as copies of the complete Ottawa Built Heritage database for Kitchissippi. (3) As always, a ton of great old photos from the neighbourhood, include a blow-up of a recent amazing find: a gorgeous photo of the Convent and what is now the Wellington/Island Park Drive intersection from the late 1890s. (4) Kickoff a discussion on what our group could do to benefit each other an the community: some ideas include resource/knowledge sharing, event sharing/assisting, project organizing, support to Heritage Ottawa and the Council of Heritage Organizations of Ottawa, community assistance & guidance on the heritage process, etc. I invite you all to come out, meet your fellow history buffs, and help start up something which I think could be a lot of fun. No commitments required, all levels of interest are welcome. Come just to backbench and listen in, come just to see the photos, or come to roll up your sleeves and dive in to the exciting (and largely untapped) world of Kitchissippi history! I'll be promoting this event over the next few weeks, and you may see something on it in the Kitchissippi Times coming up soon as well. Feel free to pass on the word to anyone you feel would be interested in attending. I hope the date/time allows you to attend! A huge thanks to Thyme & Again for allowing us to host this event in their store! 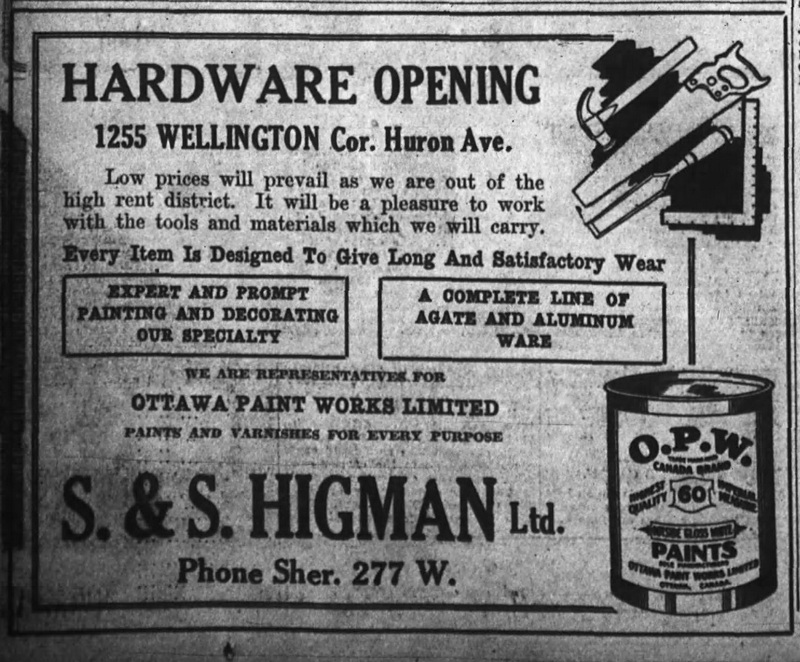 I'm excited that this meeting will be taking place in their historic Wellington Street store, which opened as S & S Higman's hardware shop in October of 1922! I am looking for best and affordable event venues for my company’s annual day party. Never did arrangements for corporate parties, so not having much idea. Hopefully, will be able to plan a flawless party.